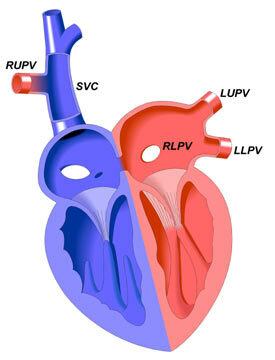 In this rare defect, one or more of the pulmonary veins carries blood from the lung to the right side of the heart, rather than to the left atrium (LA) as in the normal heart. The anomalous (abnormal) pulmonary vein or veins may be connected directly to the right atrium (RA). They may also be connected to one of the veins that carry oxygen-poor blood from the body to the right atrium, such as the inferior (IVC) or superior vena cava (SVC) (as shown in the diagram). There are many variations of this anomaly, which occurs in boys and girls with equal frequency. Diagnosis is usually by an echocardiogram or MRI.